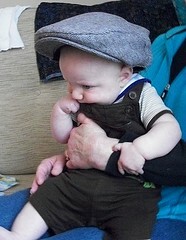 needs a good stout blackthorn walking stick..
At 3ish, maybe younger, Arthur loved trying to walk in adults' shoes. My MiL painted a watercolor of Arthur laughing, standing in his grandfather's shoes, in front of a smiling grandpa. 2ish, he was climbing up and down any staircase he could get to. Have fun with Indy at those ages/developments, and keep sending picutres! Awwww! Such a handsome man! Ae-up, luv! E's fair ready t'go down pit! Put some boots on 'im and point 'im to'ards colliery! Ae, and stick kettle on when you done! Nought like a good cuppa! OK, that is too cute for description.